This workshop was created by the Port Townsend Marine Science Center (PTMSC) with funding from Washington States Department of Ecology. 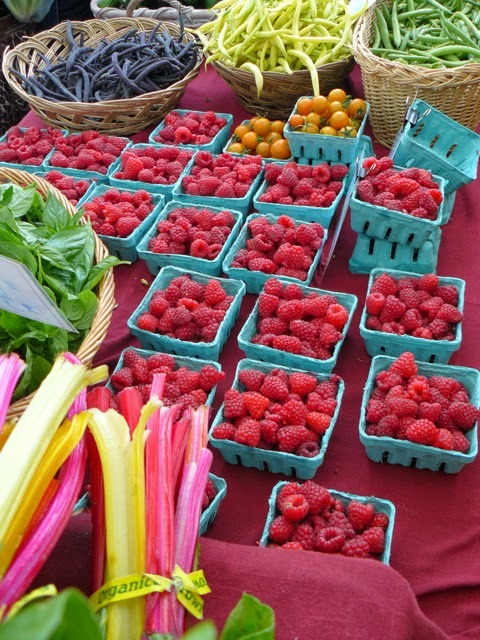 The goal of this workshop is to bring people together to take on toxic chemicals that challenge their everyday life. Each week will focus on a different aspect of your life: cleaning products, personal care products, household items, and food. Questions or concerns please contact Program Lead Megan Veley at mveley@ptmsc.org or leave a message at 360.385.5582 x 104. 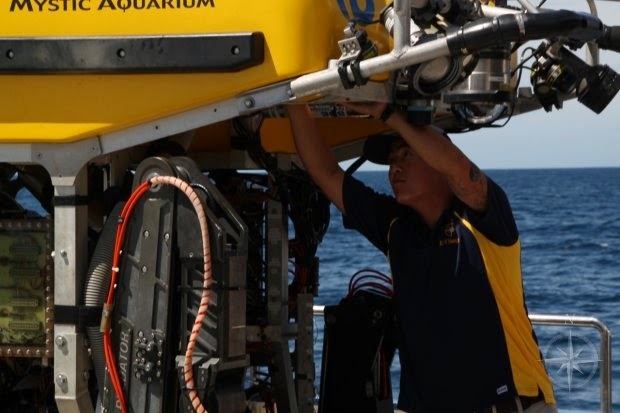 In the Fall of 2013, PTMSC volunteer Nam Siu was fortunate enough to participate in the Ocean Exploration Trust’s Ocean Science Internship aboard the E/V Nautilus. Nam decorated this styrofoam cup with the PTMSC logo and sent it down to approximately 4000ft with ROV Hercules and ROV Argus. The tremendous pressure at that depth crushed the cup to its current size. This dive was made during the last leg of the 2013 exploration season off the west coast of Grenada, where the E/V Nautilus and her ROVs were exploring “Kick’em Jenny” the largest active submarine volcano in the Caribbean. 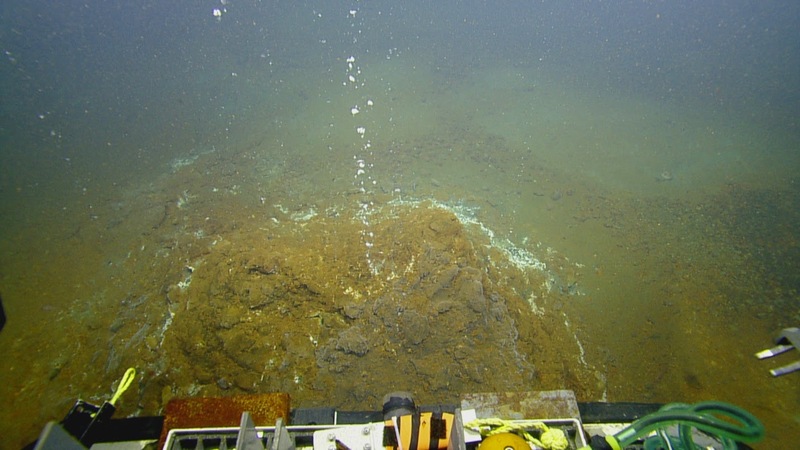 During these dives, the ROVs explored iron-rich hydrothermal vents with orange bacterial spires, methane cold-seeps with the world’s largest mussels at 14inches, and the abyssal planes around the volcano. The Ocean Exploration Trust (OET), founded by Dr. Robert Ballard (famous for discovering the wrecks of the Titanic and battleship Bismarck and many other ships), is a non-profit organization for ocean exploration and education. 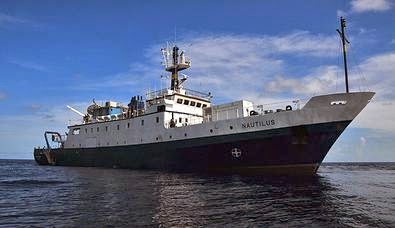 OET owns the Exploration Vessel Nautilus, a 211ft research ship outfitted with two remotely operated vehicles used to explore the seafloor in real-time online via telepresence technology. The E/V Nautilus spent the 2013 exploration season in the Caribbean Sea exploring the “Caribbean Ring of Fire”, which is a series of submarine volcanos located on the eastern edge of the Caribbean plate caused by the subduction of the Atlantic plate. Thanks Nam for including PTMSC in this amazing adventure! 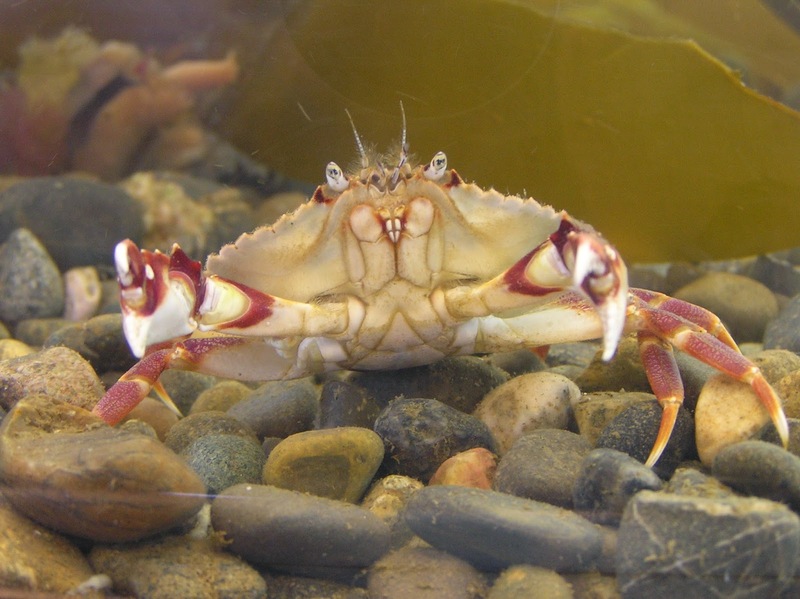 Over the months of January and February, an excess of 700 squirmy elementary kids swarmed the touch tanks and beaches, searching for crabs and marveling at intertidal invertebrates. Across the street, at the Natural History Exhibit, their classmates dressed up as birds, examined stuffed specimen, and conducted bird surveys. Each year, the Marine Science Center offers science classes to schools around the state, free of charge! We pick two classes from our selection of amazing curricula (or make two new ones), and the AmeriCorps team up to teach them, oh about 40 different times. 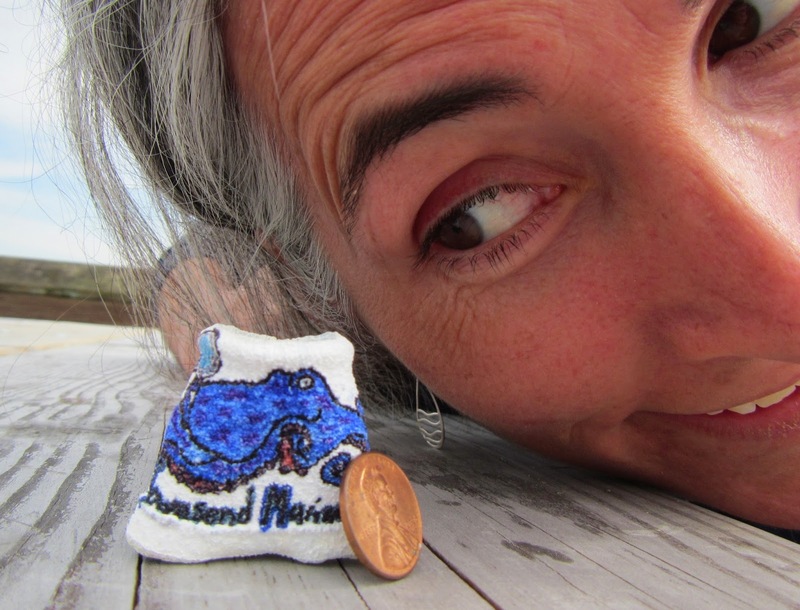 This year's classes were Crab Lab and Birds of Shore and Sea. So what's it like teaching 4th and 5th graders?? Take a closer look with me, as we dive into the inner-workings of my life on a Free Science Class day. At 6:00am the alarm goes off, but it's Mango that actually gets me out of bed. She is so excited to be awake she can hardly contain herself. Since I will be wiped out by this evening, I'm forced into early morning runs. I chase Mango through the woods, then hustle back to get ready for work. I inhale breakfast (a bowl of cereal with a few dribbles of flax milk since I keep forgetting to buy more), slap together a PB&J for lunch and grab any snacks in sight, then fly out the door. I hop on my bike, promptly realize I forgot my bike lights, get off my bike, zip back inside, return with the missing items, and peddle, peddle, peddle! By 8:00am I am pulling out the class material, clipping worksheets to clipboards, arranging chairs, and writing the schedule on the white board, all at once. An hour later, the call from my fellow AmeriCorps comes over the walkie-talkie, "Yellow bus at the top of the hill! ", "Roger that! Over and out." I reply. We wave to the kids, greet the teachers, and direct the whole lot of them straight to the restrooms. Classes never start on time. We quickly hash out a plan of how to make up for lost time. One class heads out to the pier for Crab Lab, following at the heels of my AmeriCorps partner, and the other mobs me at the entrance to the Natural History Exhibit. Then the fun begins. "Raise your hand if you already know birds are cool" I say, and 25 arms shoot up into the air, including my own. "Great! My job is done. We can all go home now" I joke. We spend the next hour and half learning about bird characteristics, adaptations that help marine birds survive in their environment, and getting up close and personal with "study skins", which are stuffed birds that do not fly away no matter how crazy or loud we are (and believe me, we are both). As exciting as the class activities are, the highlight is at the end, when we all go bird watching. Someone points excitedly to the mossy roof of the Marine Exhibit. Fifteen pairs of bright yellow binoculars zoom to the left, along with fifteen bird guides attached to sticky fourth-grade fingers. Their faces light up as they successfully identify and count their first sighting-- about 30 rock pigeons. Twenty minutes later, we file back into the classroom, briefly recap what we learned, and then record our bird survey data onto brightly colored bar graphs. By this time, nobody can hear me over the rumble of their own stomachs. Finally, the moment they have all been waiting for arrives: LUNCH! I release the pack of hungry wolves. They chow down their food at the beach, beneath the watchful eye of several crows and a handful of chaperones. Meanwhile, back in the classrooms, we get ready for Round Two! When lunch ends, the classes switch and we do it all over again. After waving goodbye to the kids and watching the yellow bus climb back up the hill, I undo everything I did that morning. I put away the class material, unclip the worksheets from the clipboards, put away the chairs, and erase the white board. I also wipe wet-erase marker off of 30 bird ID guides, sweep the floor, untangle the binoculars, and make sure the beach is free of wrappers. More than once it has crossed my mind that I spend double the amount of time preparing for the classes and cleaning up afterwards than I do actually teaching them. After the kids leave and the sugar high of teaching has dissolved, I crash hard. My body is physically drained of energy and my brain refuses to do anything resembling productivity. So I sit down, breathe a few deep breaths, and read the students remarks on their favorite part of the day. "What was your favorite part about today's classes?" Written on nearly everyone's paper are the words "Bird watching" scrawled in typical fourth-grade fashion. Some even say the best part was having wonderful teachers. It fills me with pride. This, my friends, is why I love teaching. Sure it's exhausting, but it is also exhilarating, exciting, inspiring, and rewarding. Words of encouragement from a fifth grader. Teaching young minds to appreciate nature is imperative to the conservation of the Salish Sea and beyond. Through Free Science Classes at the Marine Science Center, kids are given a chance to see first-hand the splendor of a marine bird, learn the importance of crabs, and so much more. If even one of our short-term students decides to pursue environmental conservation, it will have been worth every exhausted evening and frantic morning that we put in. Call me optimistic, but I think there will be more than one.